Dr. Armin Wedel, head of division at the Fraunhofer Institute for Applied Polymer Research (IAP) in Potsdam-Golm believes time is slowly running out for bulky television sets, boxy neon signs and the square-edged backlit displays we all know from shops and airports. 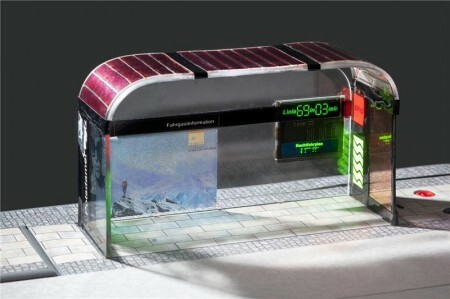 Organic light-emitting diodes (OLEDs) – here at the bus stop of the future – will soon come out of printing machines. © Fraunhofer IAP. Image Credit: Till Budde. Click image for the largest view. It won’t be long before families gathering together to watch television at home will be calling out: “Unroll the screen, dear, the film’s about to start!” And members of the public may soon encounter screens everywhere they go, as almost any surface can be made into a display. Wedel has good grounds for the expectation. The first curved screens were on display at this year’s consumer electronics trade show (IFA) in Berlin. The technology behind it all is flexible organic light emitting diodes (OLEDs). “These may just be ideas at the moment, but they have every chance of becoming reality,” Wedel said. 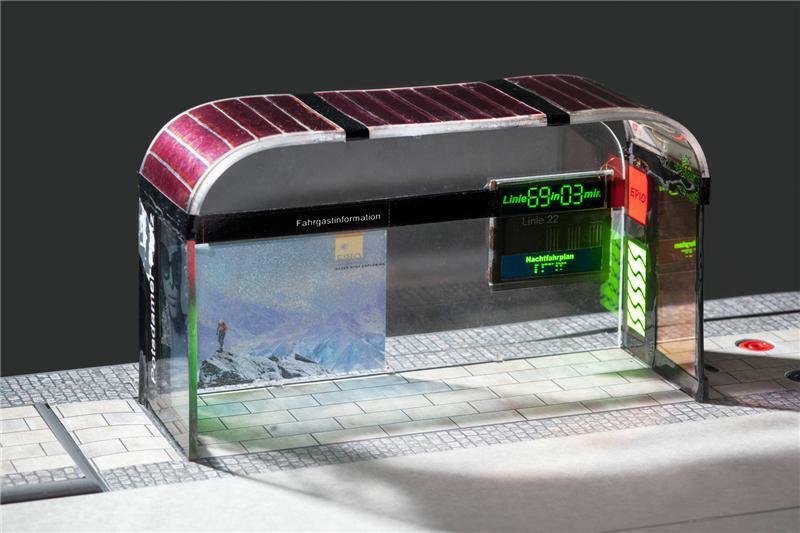 What’re coming are flickering façades, curved monitors, flashing clothing, fluorescent wallpaper, flexible solar cells – and all printable. This is no make-believe vision of the future; it will soon be possible using a new printing process for organic light-emitting diodes. According to Wedel the potential offered by this technology extends beyond screens and displays for consumer electronics, according. He believes OLEDs are also ideally suited for all kinds of lighting and for digital signage applications – that is to say, advertising and information systems such as electronic posters, advertisements, large image projections, road signs and traffic management systems. The Fraunhofer scientists worked together with mechanical engineering company MBRAUN to develop a production facility able to create OLEDs as well as organic solar cells on an industrial scale. The innovative part is that it is now possible to print OLEDs and solar cells from solutions containing luminescent organic molecules and absorptive molecules respectively, which makes printing them onto a carrier film very straightforward. Usually, printing them involves vaporizing small molecules in a high vacuum, making it a very expensive process. Previously scientists used various printing technologies to design components on a laboratory scale. They can now produce larger sample series – and this is particularly advantageous for the applications that the IAP has in mind, as large illuminated surfaces and information systems require tailored solutions produced in relatively small numbers. “We’re now able to produce organic components under close-to-real-life manufacturing conditions with relative ease. Now for the first time it will be possible to translate new ideas into commercial products,” Wedel says. At the heart of the pilot plant is a robot that controls different printers that basically act like an inkjet printing system. OLEDs are applied to the carrier material one layer at a time using a variety of starting materials. This produces a very homogenous surface that creates a perfect lighting layer. “We’re able to service upscale niche markets by offering tailored solutions, as we can apply the organic electronic system to customers’ specifications, just like in digital printing,” explains Wedel. Industry experts estimate that printed OLEDs pose the promise of becoming a billion-dollar market. “The focus in Germany and Europe is on OLED lighting because this is the home market for large companies such as Osram and Philips,” explains Wedel. “The manufacturing facility will help secure competitive advantages in this particular segment of the market. It strengthens the German research community, and also demonstrates the capabilities of German plant engineering,” says Dr. Martin Reinelt, CEO of MBRAUN in Garching. OLEDs have several advantages over conventional display technologies. Unlike liquid crystal displays they do not require backlighting, which means they consume less energy. Because the diodes themselves emit colored light, contrast and color reproduction are better. The electroluminescent displays also offer a large viewing angle of almost 180 degrees. And because they require no backlighting, they can be very thin, making it possible to create entirely new shapes. Wedel is probably right that the technology is coming, and likely faster and soon that he might think. There is no reason to think that the Japanese, Chinese and other Asian tiger economies are not working at the technology too. Research activity in the U.S hasn’t completely stopped. Perhaps the German companies can get a head start, and that others will vigorously pursue their lead.